Stid: Hardly surprising, since the cost of picking up a pen and writing a story is somewhat less than the cost of building a rocket. 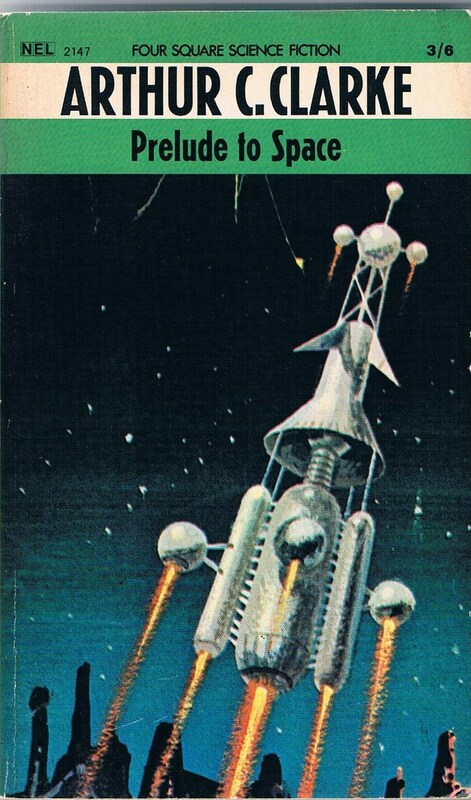 I'm referring, now, to proper Space Programs in fiction. 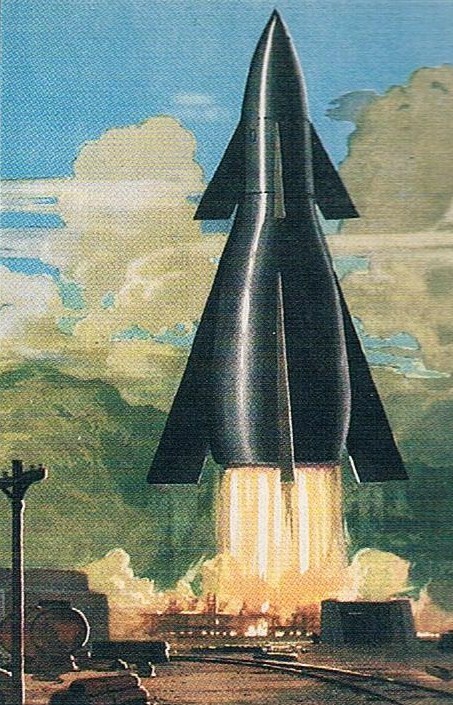 Big national or international projects, with realistic rockets. Not lone back-yard antigravity jobs like Mr Cavor's in The First Men in the Moon. Stid: And before you get carried away don't forget that in this part of your website you're supposed to be discussing Earth. Zendexor: Quite. So here I look at the Old Space Program from the Earth viewpoint. That is, from the ground: how a space project grew, how it took shape. The might-have-been arrival of the Space Age. 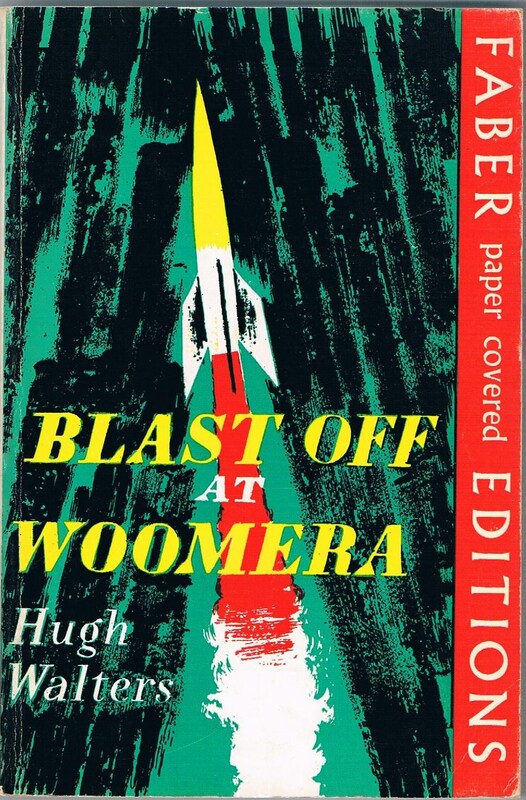 Let's first consider Blast Off At Woomera. 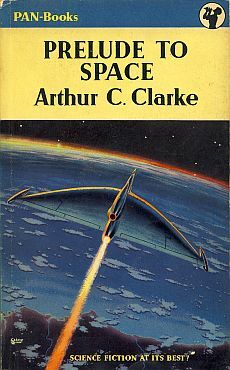 Quite remarkably, the novel is about the build-up and the outcome of a 12-minute sub-orbital flight, maximum altitude 158 miles. I say "remarkably" because, although the point didn't occur to me in my early teens when I first read the book, more recently when I re-read it (at age 61) I suddenly realized: hey, this author deserves a lot of credit for the way he can construct a story focused on such a brief flight, and build up the interest and suspense with such realism. Harlei: But that's only the long-range general motivation. In Blast Off At Woomera there's a more immediate worry. Stid: That's something NASA could do with now, to extract more dollars from Congress. Zendexor: Yes, but it's evident that the flight was going to happen anyway, it's just that without the alien business it would not have happened so soon. And because it had to be so soon, there wasn't time to build a bigger rocket than the ones available - so a very small astronaut had to be found, which is why the seventeen-year-old four-foot-ten Chris Godfrey was asked to go up. You can just about imagine this happening. It's a reasonable excuse for a plot in which the first man in space is a boy. Stid: That's the ticket. An excuse is what's needed, in children's science fiction books, to make it all happen to a child. Harlei: Like in the Alex Rider books, there's a good excuse given, for employing a fourteen-year-old as a spy. Stid: Though to be accurate the later flights, in sequels to the book, are made under the control of the United Nations. Zendexor: Ah but the British cultural flavour remains tastable. 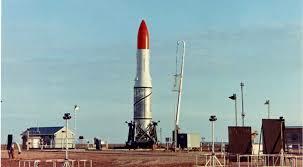 By the way, another British space program centred on Woomera - much more secret and "on a shoestring" - is enthrallingly described in the first few chapters of No Man Friday (US title First on Mars). Something written even earlier! 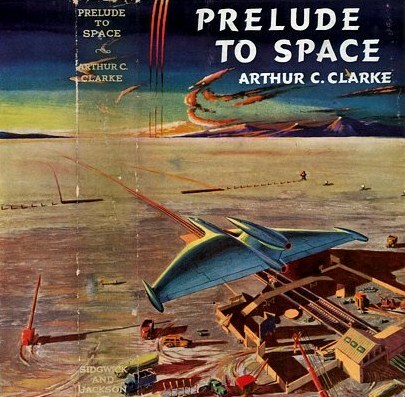 Prelude to Space was penned in 1947, though published some years later, in 1953. Zendexor: Sorry, sorry. Must stop this naughtiness. Where was I? Points in common. Prelude to Space like Blast Off At Woomera has a British feel to it. In Prelude the key organization, 'Interplanetary', is international ("about a fifth of the staff" being American), but the weighting is considerably British. The headquarters is in London, the launch site is in Australia and the three-man crew of the moonship are all from the Commonwealth, if I remember correctly. Prelude is a drier, gentler, less dramatic story than Blast Off. Whereas Prelude was written for adults, Blast Off was written for youngsters. In Blast Off a foreign agent almost scuppers the mission in a dramatic and murderous scene in the control room. In Prelude the only hostile intervention comes from a religious nut who does no damage except to himself. On the other hand, I can think of two areas of excitement in which Prelude is bound to trump the other book. Three-man crew - like Apollo 11, though all three of them land on the moon in Prelude. Earth-orbital rendezvous - as opposed to lunar-orbital rendezvous for the Apollo missions. Atomic powered spaceship - as opposed to chemical fuel for Apollo. Eight-day stay on the Moon - rather than the few hours for Apollo-11 (and three days for Apollo-17). Landing in the Mare Imbrium - compare the Mare Tranquilitatis for Apollo-11. Harlei: I know - I can guess what you're driving at - you can watch the divergence! Across a thirty-year gap you can examine how wide of the mark the guesses become. Zendexor: Yes, it is both fun and thought-provoking, to get glimpses of what might have seemed reasonable in 1947 concerning 1978. Stid: So how much did you enjoy reading Prelude to Space? Would you recommend it to me? Zendexor: I'd hesitate before recommending anything to you, but yes, I enjoyed it. Actually, this was my third read of the book. I enjoyed it the first read, was rather bored during the second many years later, and then recently when coming to it for the third time I went back to enjoying and appreciating it. Make of that what you will. Harlei: It's whatever you expect from a book, which determines whether or not you enjoy it. If you're in the mood for contemplating historical resonances, Prelude to Space sounds like a good read. For the glorious moment when you're asked to become the first astronaut, see the OSS Diary for 12th August 2016, discussing Blast Off At Woomera. Or the glorious moment when you're offered your first trip to Mars, see the OSS Diary for 11th August 2016, discussing Mission to Mars by Patrick Moore. For Mercury, the Moon and the old space program, see the OSS Diary for 17th September 2016. See the OSS Diary, 24th October 2016, for preferring to "do things in the right order", that is, concentrate on the Moon before aiming for Mars. I return to this theme in Musk Aiming for the Wrong Target. For thoughts on paranoid plots regarding the demise of the Old Space Program, see the OSS Diary for 2nd November 2016. See also Secretive O.S.P. For the one-man mooncraft of Operation Columbus by Hugh Walters, see the OSS Diary for 4th November 2016. See also Hugh Walters and the Moon. See the Diary for 2nd December 2016 for an illustration of an old-style space-suit looking like a suit of armour, from High Road to the Moon. For the OSS/NSS boundary tale The Pro, by Edmond Hamilton, where the Old Space Program meets the new, see the OSS Diary for 8th January 2017. 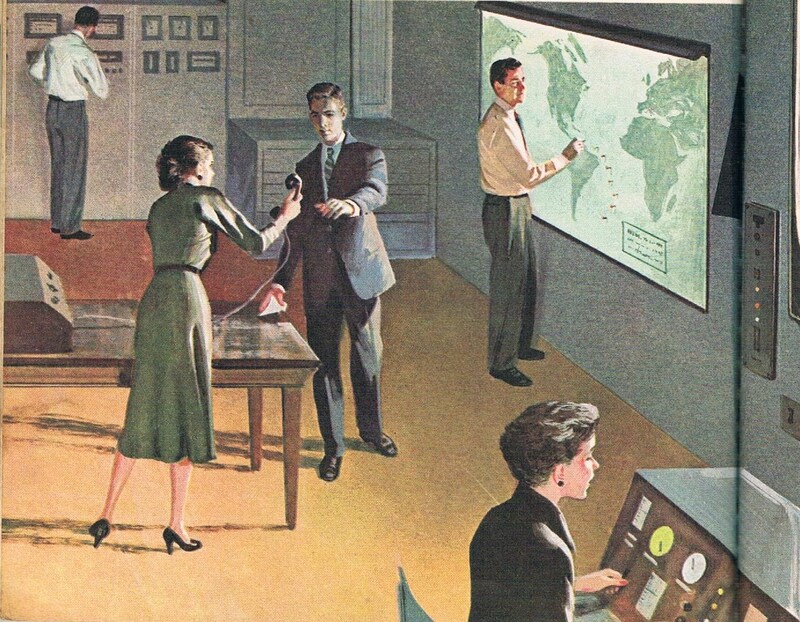 For an old-style Cold War Moon with British, US and Soviet bases, see the OSS Diary, 10th February 2017 discussing Moonbase by E C Tubb. For Old/New Space Program comparisons, see Safety Last. 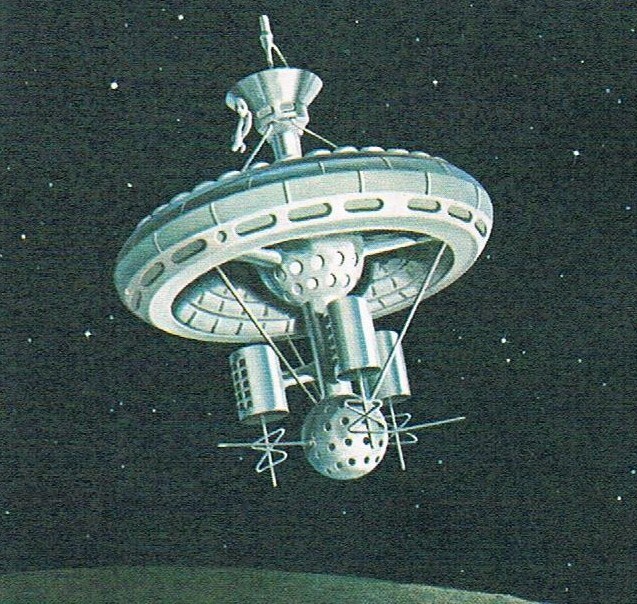 But see also the retro design of Space-X's "Starship Hopper" influenced by the 1954 Tintin adventure, Objectif Lune, mentioned in Astronautical Conjunction. What Might Very Well Have Been. For You Will Go To The Moon by Mae and Ira Freeman, see A Book with the Right Idea. See also the Diary entry, The Belated Old Space Program. See the Diary entry, Shades of the H-R Diagram, for ideas that might be used in researching the history of what was thought reasonable in astronautical fiction. 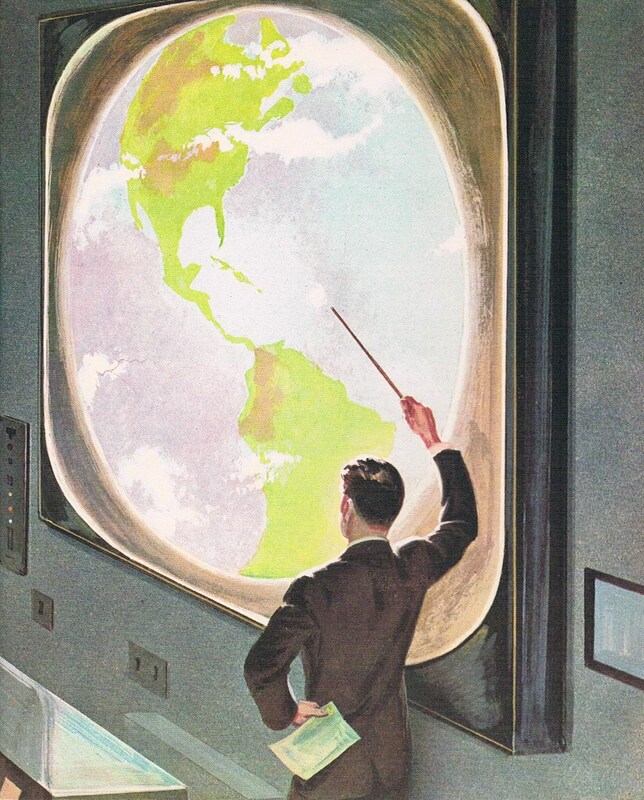 On jingoistic 1950s attitudes see Fletcher Pratt and the creaky Cold-War space program.